I'm so sorry for the lack of updates. I've been consumed by the world lately. I will say, however, that I am currently working on four different projects, two of which are poems in anthologies due out this fall and in 2013. It's been a while since I've written poetry, so I'm pretty excited about those opportunities. Once they are finalized, I will let you know details. I'm afraid that I will not be able to finish Flowers in the Dustbin by October. I tried, but I'm just not close enough to complete it by that time. I am still going to be appearing at the 2012 NYC Collectible Paperback and Pulp Fiction Expo, though. So, I do hope that those of you who are in the area or plan to be will stop by and see me then! I'll have copies of Dial 999 with me as well as books from the incredible Barry Crowther. I'd love some feedback regarding the upcoming Jon Hunter book (Flowers in the Dustbin). The first book (Dial 999) was written in first-person, from the point-of-view of our protagonist. Should I stick with that or mix it up? The plot in this next book is going to be more intricate, so I'm wondering if first-person won't be good enough or appropriate? What about a mix between first-person and third-person? Is that too confusing? I welcome your ideas on this. I've read books that have done this, and it worked for a handful but failed for most. So, I'm afraid that I'm being too ambitious if I do it for my sophomore effort. For those who have asked me about where they could see some of my work in print (such as my poetry and essay submissions to other zines and anthologies), I've created a page here on my site that lists them. I still need to fill it in, which I will try to do by the end of this weekend, but it now exists! It is the final link on my "Book List" page. Also, a little prayer out to Rozz Williams, who has been gone for many years now but is not at all forgotten. R.I.P. The other manuscript I unearthed has required more work than I originally thought, so I’m not sure when that one will be ready for publication. I promise it will be worth the wait, however. It’s turning out to be incredible (and long!). As I can’t say it enough, thank you so much for your unending support! I know many of you have been with me for nearly two decades now, and I appreciate it down to my marrow. Be safe, and enjoy this new collection! The first of those two poetry collections I mentioned previously is being prepped for publication. It is titled Razorwire Embrace and is quite classically “me,” though, perhaps, with a bit of an edge I hadn’t gotten yet 10 years ago. I look forward to your comments and reviews on it! I’ll make another announcement once it has been released. I’ve also been toying with an idea since this new year began, and I’d love your input. Now that I’ve been using Lulu.com for my printing, it is a hell of a lot easier for me to handle print projects. And one thing I had stopped doing many years ago because of the time and cost of printing was publishing Erased, Sigh, Sigh., Via Dolorosa Press’s literary journal. I loved putting that together more than anything, but it was just too hard for me to do on my own after a while. So, my question right now is if ESS is something you’d want to start reading again? I guess I’m just wanting to gauge what the interest would be. It would continue to be something that came out twice a year, but it would no longer be hand-bound with ribbon on parchment paper. Sure, that looked pretty nice, but it was too costly and time-consuming for me to do at the volume I needed to, unfortunately. So, please share with me your thoughts on this. 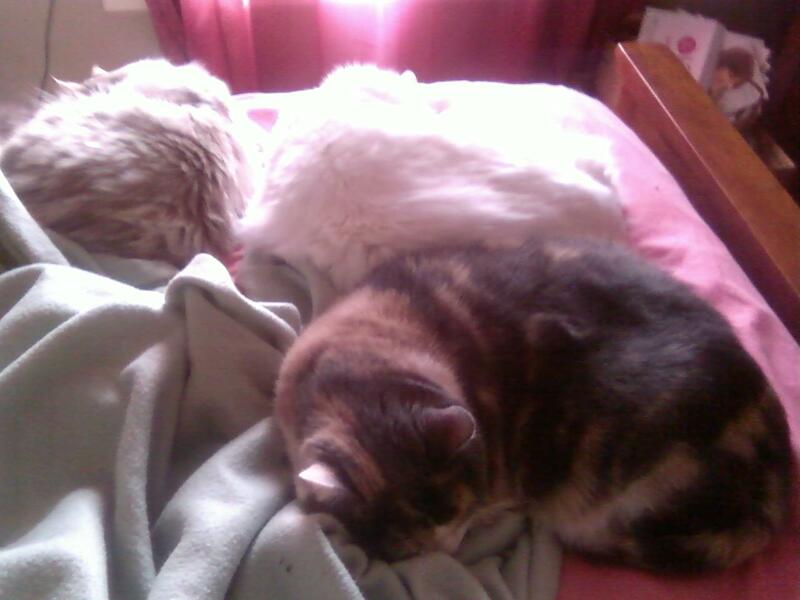 The cats kept me company this morning, though I question their motive considering they favored my injured leg. I tried to think of it as three vibrating heating pads...even though I’m sure what I was supposed to have were three ice packs! Still, they were too cute to disturb. Right now I’m relaxing with some tea and considering the roles a couple new characters are going to play in the second book (Flowers in the Dustbin). I admit to being a bit nervous about the sophomore effort. It’s probably the feeling many bands get when they’re working on their second album. Will it be as good as the first? Will it be what people expect, or will it give them a new direction? In particular, I’m nervous about how to treat the characters that are continuing from Dial 999. I don’t want to repeat too much stuff because I don’t want to bore those of you who have already read it. But, I also don’t want to alienate readers who haven’t read Dial 999 yet. Is this a legitimate fear? I welcome your comments on this as I am writing the book. I started chapter one since I’ve outlined the book already, but I’m still putting together the details of the plot so I have lots of room to play. And, on that note, I wish you all a wonderful (and safe) New Year! If you are in the US, please don’t forget about something called Tipsy Tow. From 6pm-6am on New Year’s Eve/Day, they will take you and your car home for FREE. You do not need to be a member of AAA to take advantage of this. The number is 1-800-222-4357. If you do not have a designated driver tonight, please be sure to call them! How's this for a Christmas gift... I've just discovered two almost-complete collections of poetry that I had once planned to release but must have lost in the shuffle. Anne Sexton--- the game is back on, girl! I hope that all of you had a wonderful holiday (of the many that just passed)! Mine were calm and warm, which is how I always hope they’ll be. My family is small, but close-knit, and I cherish all the moments we still have together. Candles were lit for those who have passed, and giggles echoed from those who have newly arrived. That’s really the meaning of the season for me. It’s not Santa, not Jesus, not Nature or any other force or presence; it’s the love and life between us. That will certainly explain why the greatest gift I received this year was an unexpected visit from my best friend (those of you who followed my Via Dolorosa Press career will know him as Sasha I. Nyktos). I can’t remember the last time my heart swelled that much. I swear, if people paid attention to the way that feels, we’d live in a world free of war. Lest I turn into a hippie before this post is finished, I also received a fabulous gift from my husband that included Siouxsie and the Banshees’ BBC recordings. The teenager in me thoroughly enjoyed watching the dvd with my parents while they cringed. Can’t let them forget those fabulous days of having to listen to Siouxsie, Christian Death, and Fields of the Nephilim as they blared from my stereo! I have a lovely week off from my university job at the moment, so I’m going to be finishing up adding and organizing content here on my web page. I unearthed some of my old poetry chapbooks, and although many make me wince now, I will share any gems hidden in them with you since most of them are no longer in print. Many happy wishes for a brilliant new year! Thank you for sharing in it with me! Welcome to my gorgeous new website! Many thanks to the lovely Elisabeth Butler for creating and designing it for me. She is fabulous! Please bear with me as I start putting content up. I've got so much to add here but also have a day job at a university, so until the semester is over I'm crazy busy. In the meantime, please feel free to check out my new novel, Dial 999. You can find it on the publisher's website: www.realityasylumbooks.com as well as through Amazon.com, Barnes & Noble, and Lulu.com. I thank you all for your incredible support over these many years.